Laufen will present the Dim Sum installation at the Kartell flagship store in Knightsbridge during London Design Festival (LDF) from September 15 to 23. The conceptual exercise on washbasin design was created by Ludovica + Roberto Palomba, who designed the Laufen by Kartell collection, and made its debut at Milan Design Week. Created to reflect where East meets West, the project took its cue from Chinese dim sum tableware to showcase washbasin prototypes. It features a central table featuring traditional and futuristic forms using Saphirkeramik, which enables the creation of fine line sanitaryware. Starting with the colour of foods, Ludovica + Roberto Palomba have created forms that feature shades of red, green and brown to create contrasts. 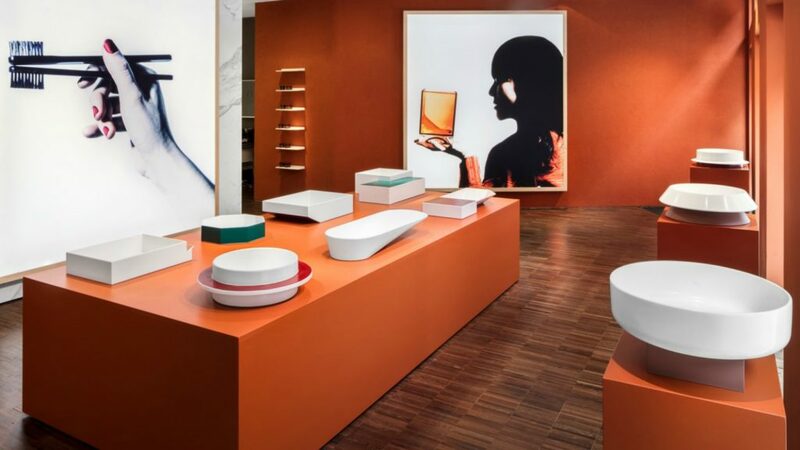 The box-like installation features orange walls taken from the palette of Le Corbusier to represent the birth of the Kartell by Laufen project. They form the backdrop for photographs which are an ironic take on the relationship between food and the bathroom, where toothbrushes are shown as chopsticks and soap dishes are sauces. Kartell by Laufen recently extended its bathroom collection, from washbasins and brassware finishes, through to extending the colour of its plastic furnishings.